Pink Salmon Fishing Guided Fishing Trips — Bent Rods Guiding & Fishing Co. The Pink Salmon is the smallest of the Salmon family, but certainly one of the most sporting, abundant and easy to catch. 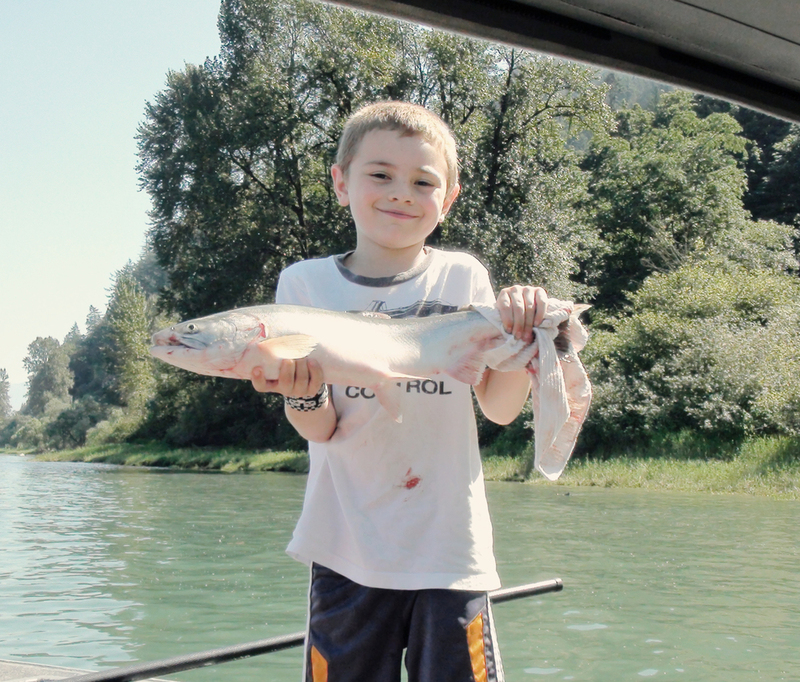 Pinks or “humpies” as they are affectionately known, are great sport for the Fraser Valley angler. These fish return on odd numbered years by the tens of millions. The Pink Salmon will readily attack almost any well presented lure or fly, but anglers truly dialed in on these fish record daily catches that are too numerous to keep track of. At Bent Rods we have a number of ways to target the “humpies”. Jig fishing, spoon tossing and fly fishing are the favored methods, and we make custom lures for our endeavors. Twitching Jigs are quickly becoming the favorite method for both guides and local anglers. Extremely simple and amazingly productive, this method can be mastered in a day by anglers of all ages. Bent Rods can supply you with the finest quality Jigs on today’s market and our guides are constantly tinkering to achieve Jigs that will simply out-fish all others. If you are in need of Jigs for the upcoming “Pink” season, call us and we can hook you up with the Jigs that “top guides” use to consistently “hook up”. The Pinks typically arrive around the last weeks of August and their numbers build through September as the river literally “boils” with them for September and early October. The early fish are silver bars and great table fare, limits are common and the fight on light tackle can be fantastic. We fish for Pinks using ultra light gear rods and 6wt fly rods, maximizing their fine fighting qualities with tackle to match their size. If you happen to hook up with an extra large size male Pink, the battle can be legendary, on our quality light gear. Another aspect of the Pinks arrival which is of note for all anglers is the arrival of some absolutely massive Sturgeon, which seem to appear in great numbers when the pinks are running. For this reason we often end our days of Pink fishing, anchored up in a favorite spot and tempting GIANT Sturgeon, most often having great success. Imagine yourself anchored in a beautiful river mouth, with Pink Salmon boiling the water. Seals are all around, gorging on fresh arriving Pink Salmon, while the occasional Sturgeon breaches the water, for reasons not known. As you cast out your Bent Rods Jig, you see a school of Pinks swimming very close by. After you let the Jig sink, you begin a quick wrist snap, followed by a quick retrieval of slack line that is the method known as “twitching”. As you continue this twitching retrieve, a number of Pinks break free of the pack and are cruising towards your Jig. In the clear water you see a half dozen fish are racing for the Jig, and you can barely contain your excitement. As you tense up, 3 fish make a violent last dash for the Jig and all you can see is a flash of silver, followed by a large male Pink, violently headshaking with your Jig firmly embedded in its mouth. As the fish leaps free of the water, sending spray in all directions, you cannot help but laugh out loud, at the non stop fun and excitement that is fishing for Pink Salmon. Pink Salmon only run in our area every odd year.